The all-in-one cloud based system combines back-office CRM, job planning and scheduling and a paperless mobile app for engineers and real-time tracking of vehicles. Rory Woodhouse founded the business in 2007, aged just 22 and working from a bedroom with just one apprentice and a van. Despite starting his business at the beginning of the deep ‘credit crunch’ recession, the operation has grown organically ever since and now services thousands of home and commercial customers with a 16-strong team. The business recently celebrated its 10th anniversary. that allows back-office users to plan, manage, schedule and track work effectively including planned maintenance and urgent reactive work. In the back-office, the system is enabling planners to respond faster to customers and is intelligently allocating work orders based on real-time engineer availability, skills, live location and parts stock. This is significantly increasing productivity; minimising customer wait time and driving first time fix at competitive cost. The integrated CRM is also providing customers with a joined-up experience, thanks to automated job booking confirmations, service reminders, ETA updates on the day of service and electronic quotation and invoicing. 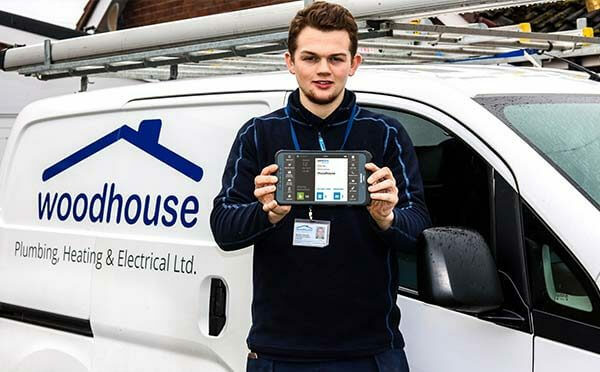 Woodhouse’s team of Plumbers and Electricians benefit from an easy to use Android mobile app. They start their day by completing an electronic timesheet and vehicle check, before instantly accessing job information. Integrated sat-nav with live traffic ensures the best route is taken and customers receive proactive updates by text and email. On arrival, the app allows team members to create instant quotes and guides them step by step through job-specific workflows. Users can search for parts and add them instantly to the job. Proof-of-service is instantly relayed to the back office and the system generates invoices, custom reports, certificates, legal documents and fully branded job-cards that are automatically shared via a customer’s booking portal or via email.